Villa Mavi Deniz means Blue Sea in Turkish and is a brand new luxury villa in Kalkan built in a very modern style and luxury inside and out. 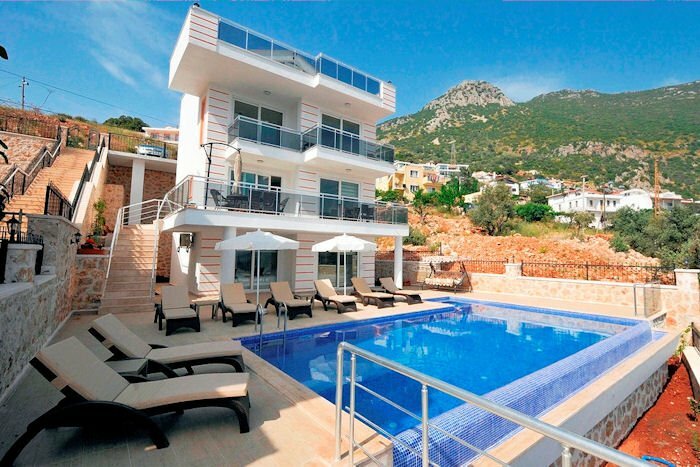 The outside space is fabulous, with its large infinity pool with stunning views overlooking Kalkan Bay and the Mavi Deniz, and plenty of space around the pool to relax on the sun-loungers provided with its amazing views. The villa is beautifully decorated and furnished to a high standard throughout with all bedrooms having their own en-suites and full air-conditioning throughout. The luxury continues outside where you can sip your sundowner in your very own jacuzzi or beautiful infinity pool. The ground floor has two twin bedrooms with the fully fitted kitchen, open plan lounge and dining room to the first floor with its own large patio/terrace to take advantage of those views. There are two further bedrooms on the second floor with the master bedroom with stunning circular bed and luxury ensuite with oversized Jacuzzi bath on the next floor. Villa Mavi Deniz is one of the best luxury villa rentals available in the Kalkan area, a great place for families and group of friends alike.